This was the only outdoor picture we have and I really love it. The delicate lace pattern really shows through on that HAT. This is our wedding party.... my sister Tammi stood with me and Bob's brother Gary stood with him. Aren't you crazy for those blue tuxedos? We also had pink and lavendar dresses for the bridesmaids. Right before we left for our honeymoon! Look at that car! Look at that waist??? Whatever happened to THAT? Bob's suit was tailor made for him. It was a beautiful suit. Awwww...what fun to look at "old" photos! 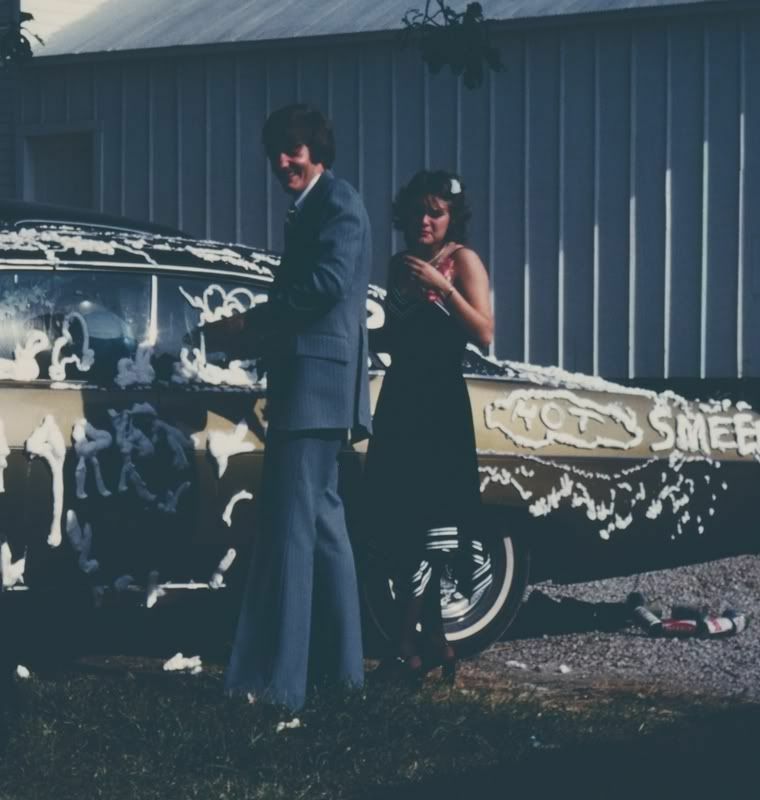 I was also married in the 70's so I remember the style. Happy Anniversary to a great couple!! You both look beautiful!! The priest actually said that????? You proved him wrong, didn't you??? Oh Terri!! I LOVE this!! First off though...happy, happy anniversary to a wonderful couple. Hmpf...shows what the priest knew right? Here's to 31 more...heck, here's to 51 more! I hope your special day is a sweet one. You are both so very special. 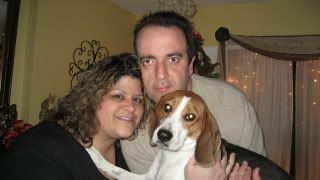 as usual I am late with congrats but I really hope you had a very special anniversary cause you are a very special lady! Happy Anniversary Terri and Bob!!! Love the pics!!! Terri, girl, miss seeing ya around GLU! Visit us soon, ok?!? We are all trying to re-group our circle journal group and get our books finished up!!! Oooooh I missed it... But Happy Belated Anniversary. Here's to 31 more! What a cute couple! And I loved the hats! I'm flabbergasted at that priest! Miss ya on GLU, chickie!!! 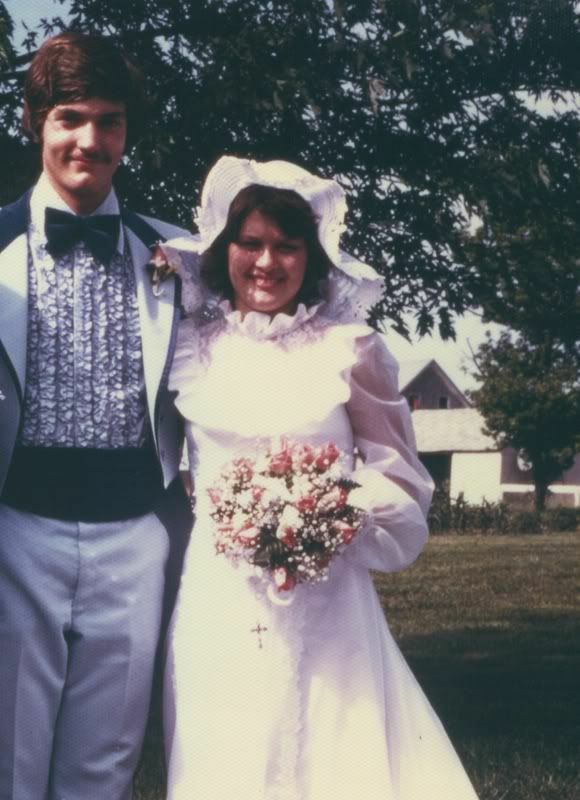 Terri and Bob, Happy 31st Anniversary! I loved the photos, just simply beautiful! Brought back a 70's memory or two! Happy Anniversary!! My husband Steve and I were married in September 1977 and he wore a suit just like your husbands!!!! We are in Australia!! Fashion travels. They though we would not last too! he, he !!!! Happy Belated Anniversary! Love the pictures. The Priest apparently thought you were two children playing at grownup...you look so young and wide eyed, after all! Congratulations and many more! Happy Anniversary! And sorry I'm late with those good wishes. I'm totally diggin' the tuxedos. LOLOLOL They were sure dashing back then, though, weren't they? You both looked stunning, though. The cake, the flowers, the hat, the dress, the tux...all of it was gorgeous. Great pictures. Oh congrats Terri! And shame on that priest...tsk tsk! You both have come through a lot together and have many more to go! Just lovely dear Terri! Come by and say hello over at my blog! Blogging just seems more my style and fits my time constraints. Tell everyone I said hello! And far less drama too! LOL! Love and miss you! Just popping by to say hello! Love the tuxedos. Quite the hipsters you two cats were back in the day! and check out her Thursday Carnival "Sincerely 'Fro Me to You". These photos would be perfect for the meme. Congratulations on a milestone wedding anniversary...something you don't see as often as we used to....MAN oh MAN...I remember all those things...we too, were married in a big ole Catholic Church...by none other than a Catholic priest and a Presbyterian minister...wow...talk about the priest not thinking that our marriage would last...I was marrying a protestant!! 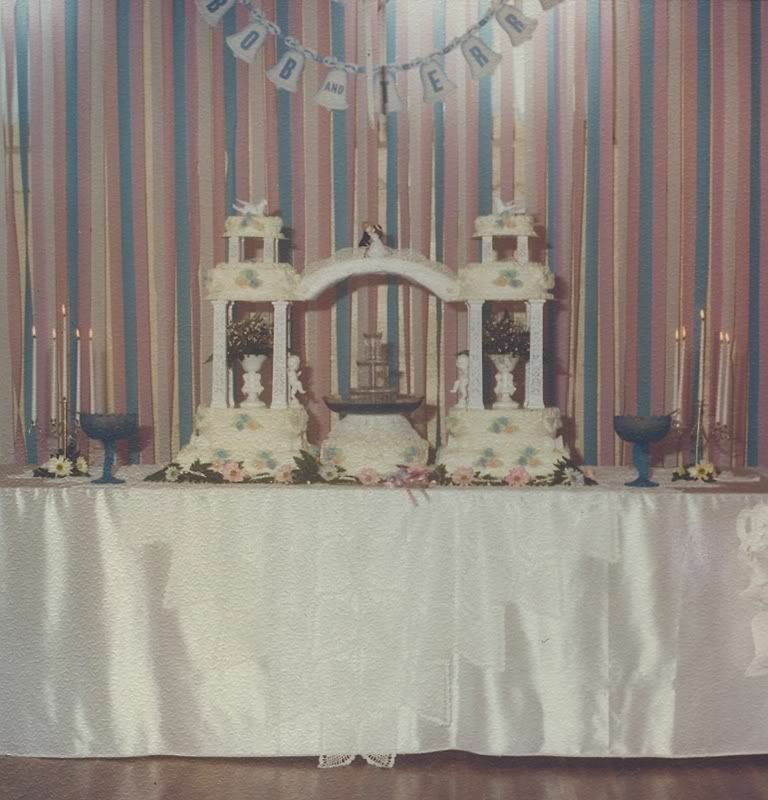 My how things have changed...I loved seeing all the photos from your wedding...I loved the cake...and the crocheted tablecloth your grandmother made...how special that had to be. My lovin' hubbin also had a hand tailored suit...must have been the thing in the 70's...OH! and my guys wore burgandy tuxes with pale pink shirts...but not hubbin he wore a white shirt...b/c after all he was the groom!